New beveled armrests are found in new affordable and deluxe models, and of all things a comfortable couch bass guitar appears. Apeaking of beveled armrests, one can be found on Dream John Petrucci Artist Choice 916cee limited edition. 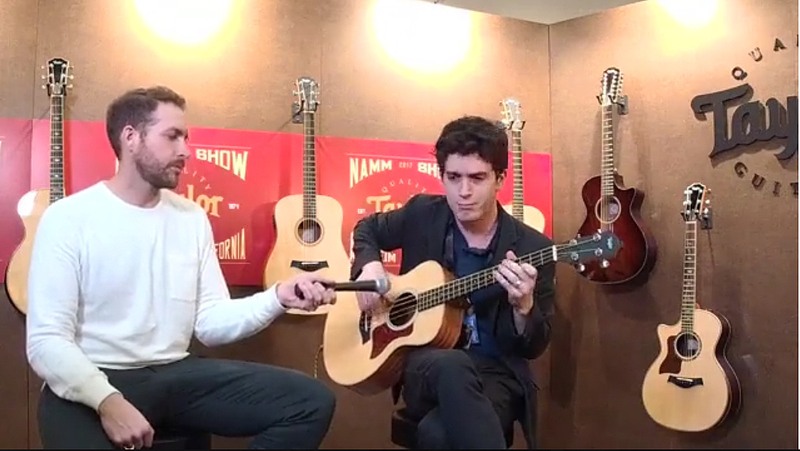 The Dream Theater guitarist was on hand at the Taylor booth to play #1 of the edition. This Grand Symphony size guitar has the same top-shelf Indian rosewood and Sitka spruce, and opulent inlays of the 916ce acoustic-electric model, along with a special label signed by Petrucci and Bob Taylor. While cool, perhaps their coolest newbie is the little GS Mini Bass. 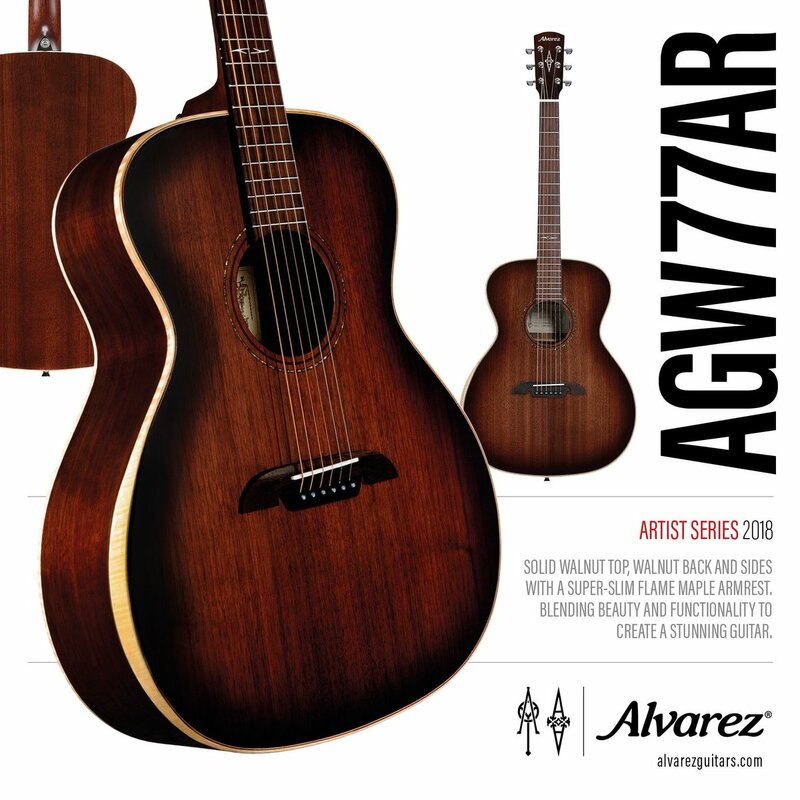 It has layered sapele veneer for the back and sides, and a Sitka spruce top, along with an ES-B pickup and preamp system, that have volume and tone controls and a built-in tuner. A bass guitar that exists beyond the parameters of what a bass normally has to offer, Master Guitar Designer Andy Powers spent years developing the concept, design, and execution of this instrument, and the special strings that allow it perform as it does. With a 23-1/4” scale, it has a very short string length, nearly 10” shorter than a standard bass guitar. And the small body appears to be derived from Taylor’s Grand Symphony shape. Taylor Guitars conceived GS Mini Bass concept with a guitar player in mind, but quickly realized “this is a bass for a bass player… that’s portable and can go places” or anyone wants to try their hand at playing bass guitar, on an easy to fret neck, in a body size suitable as a sofa instrument or travel instrument. And if that is not cool enough for you, Taylor also has a new affordable Academy Series of guitars designed with the student musician in mind, or anyone wanting an inexpensive guitar that is actually comfortable to play. 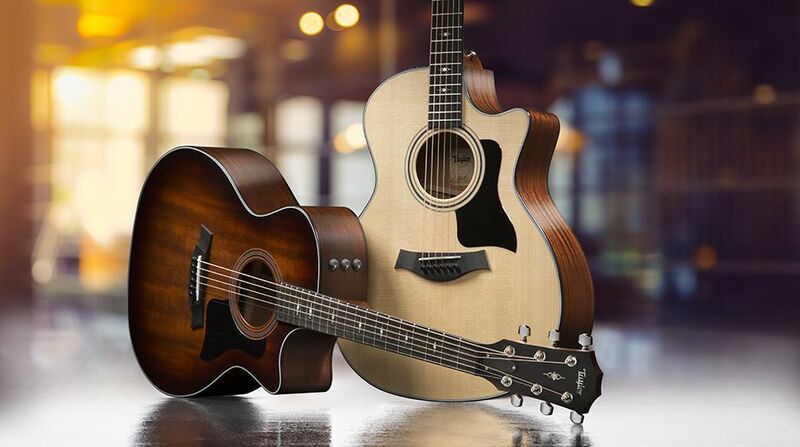 And they are coming out with 800 Deluxe versions of their recently revamped 800 Series, with the addition of Adirondack spruce bracing, and Gotoh 510 turners with 21:1 gear ratios. Both the Academy Series and 800 Deluxe models feature instruments with a bass side beveled “arm rest” built in, similar but not exactly the same as the one found in their top of the line 900 Series. 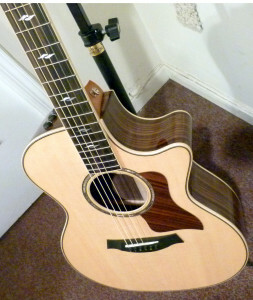 A reader asks why his custom Martin has the string spacing it does. Ok, I guess I’m a guitar geek because I love all of this information! And, it makes me wonder about mine…. Long story short, I played a lot of different Martins, figuring out what I liked. I ended up with a custom, a 000-28, Adi top with 1/4″ scalloped Adi braces, and a 1-3/4″ short-scale mod-low-oval neck. I did specify short-scale and the 1-3/4″ nut; but I didn’t specify a width for the 12th fret: looking at the build sheet specs, it shows it at 2-1/8″, not a surprise. It’s great, I’m not complaining all, just geeking out, wondering why my custom Martin has wider spacing. First of all, allow me to congratulate you on your taste in guitars. I have a custom short-scale rosewood 000 with Adirondack top and 1/4″ bracing as well. But mine has the Golden Era neck and 5/16″ string spacing, having been made before all this modern taper business came about. Your mystery is easily solved. My inner Sherlock Holmes deduces that your guitar was ordered before 2016 and the Custom Shop “starter model” was an OM-28, made with the customizations you requested. Therefore, it would by default have the High Performance taper and corresponding string spacing of 2-3/16″, which Martin changed to 2-5/32″ in January, 2016. According to Tim Teel at Martin, “the difference in spacing is literally the width of a unwound light gauge E string.” But he feels it is enough to correct the issue. When it comes to necks with a modern taper, Taylor and Collings use 2-3/16″ string spacing, as do other brands. So Martin went with that for their new taper, at first. I have heard of the derailment issue from Collings and Taylor players, but not players of Huss & Dalton guitars, which actually have even wider string spacing of 2-7/32″ for their standard 1-3/4″ neck taper. H&D does not base anything on the fretboard width at the12th fret. I called to ask, and Mark Dalton told me the measurement there is 2.184″, a smidge narrower than 2-3/16″. So its wider at the 12th fret on their standard taper than on that of Taylor, Collings, or Martin’s High Performance taper, if not by much. Personally, I believe it is an issue for any guitar with frets cut at too steep an angle, too far into the fret, regardless of the string spacing or taper. But having the string closer to the edge certainly increases the odds of a derailment happening. The times I have encountered this issue tended to be specific to a guitar, not a across multiple examples of the same model. And I tend to naturally adjust my playing over time to compensate for the occasional derailment of the string. Since your guitar has the short-scale neck, the string spacing will not be exactly the same as on a long-scale Martin at any point along the string, except right where it terminates at the saddle and nut. If I remember correctly, the strings widen farther up the neck relative to long-scale guitars. So you may never experience the derailment issue. Plus, your frets might not be cut as severely as guitars that have the issue. 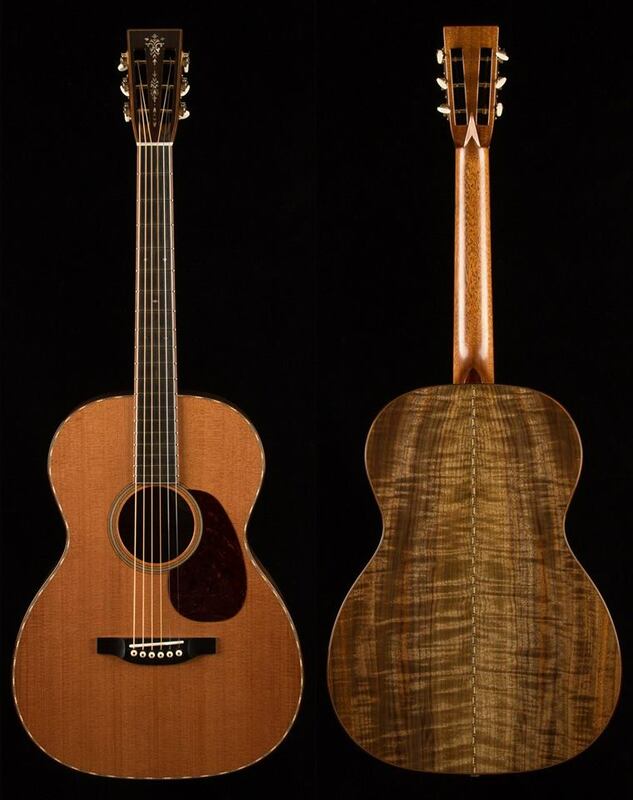 Each guitar is offered in Taylor’s popular “Grand Auditorium” body (size 14) with Sitka spruce tops and proprietary CV bracing designed for this body, and made from stiff Adirondack spruce. In addition to the on-board Expression System 2 electronics, other high-end features include rosewood binding, rosewood rosette and fret markers with mother of pearl trim, and a full gloss body. The seldom seen Florentine cutaway offers clean lines that come together in a point like the tip of a crescent moon. It is a nice touch that increases the elegance and exclusivity of these new showcase Taylor Florentine Limiteds. Evenness across the strings and up the neck, nicely balanced between power and sensitivity, the 814ce provides the commanding fundamentals with the high end sparkle and sculpted low end definition, enhanced by the extra warmth and complexity that people look for in a Taylor made from rosewood. There was that exemplary Taylor sound, where strings picked across melodies or fingerstyle patterns retained their identity, with nice separation and precision, no matter how hard or soft they were played. There too were the classic Taylor chords, each fusing the notes together into one colorful entity.